Microglia respond to CNS infection. (A) Olfactory bulb sections from CX3CR1GFP/+ mice were immunostained for IBA1 and with DAPI nuclear stain at the indicated time points relative to infection. Images are representative of 3 mice per group. Scale bars: 100 μm. (B) Microglia from naive and day-4 p.i. brains were isolated by flow cytometry and subjected to microarray analysis. Heatmap shows the 595 differentially expressed genes and log2 expression values from blue to red. (C) Pathways most altered in microglia after infection as assessed by Ingenuity Pathway Analysis. Orange bars indicate pathway upregulation; blue bars indicate downregulation of the pathway. Gray bars indicate that no direction of pathway dysregulation was detected. 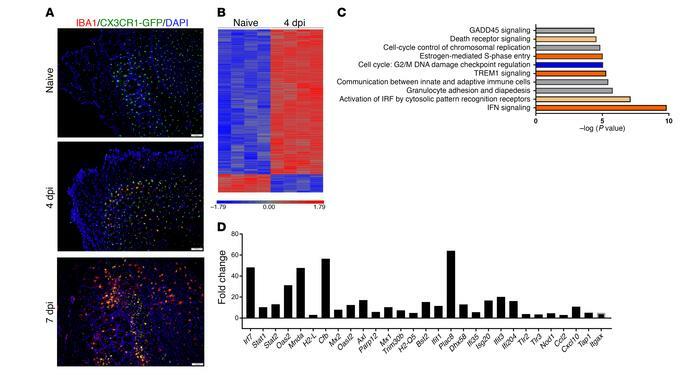 (D) Fold change of selected differentially expressed genes in microglia after infection. Data in B–D were derived from 4 independent samples per group and were analyzed as described in Methods. dpi, days post infection.